Heel to Heal is our half-marathon fundraiser that brings health and hope to the world. This year, we will be running and walking to support the fight against human trafficking. Together we can improve our health while supporting the work of International Justice Mission, a global organization that brings rescue to victims of slavery, sexual exploitation, and violent injustice. In the past 16 years, they have helped free thousands of children, women, and men across Africa, Asia and Latin America. International Justice Mission also helps survivors of violence receive the healing and restoration they need to rebuild their lives, and works with local governments to help protect the poor. 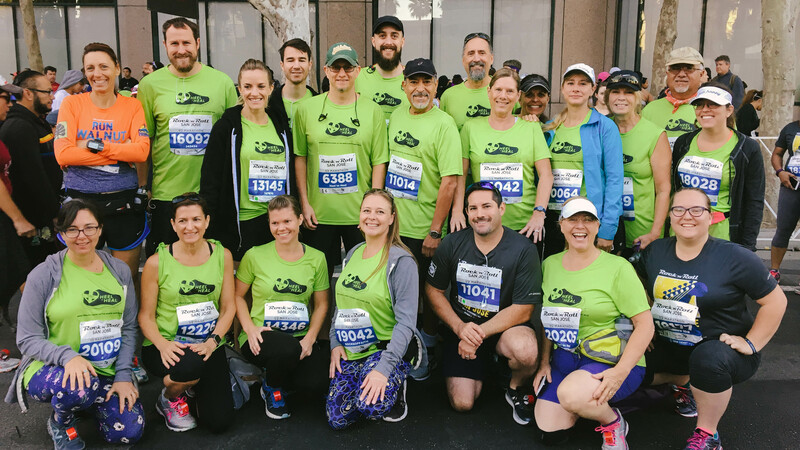 Join our team of runners and walkers and register to participate in the San Jose Rock n' Roll half marathon which takes place on October 7, 2018. Through the summer and fall, follow our training plan and participate in optional weekend group runs/walks to get ready for the big day. The training program is designed to accommodate runners and walkers at any level, from those with marathon experience all the way to those who are starting from scratch. See schedule here. Throughout the training program, reach out to your friends, family, coworkers, and other acquaintances to find sponsors for your run. All of the funds they donate will be used to support the fight against human trafficking through International Justice Mission, bringing freedom and hope to those who need it most. Your goal will be to raise $1300; one hundred dollars for every mile you will run or walk! Your fundraising will not only save and transform lives around the world, but will also provide you with an opportunity to share your heart for "the least of these" with your friends and family. Slavery is the use of lies or violence to force another person to work for little or no pay. Slavery Is Illegal Almost Everywhere. So Why Does It Exist? Millions of the world’s poor are trapped in slavery, because there’s no one there to protect them. In many places, the laws against slavery simply aren’t enforced by the police and courts—so slave owners and traffickers know they can prey on the poor without fear of any consequences at all. Slavery is a violent crime. Slavery goes beyond just a bad working condition. People trapped in slavery live under constant control and fear. They face physical, verbal and sexual abuse daily, and cannot leave to find other work or protect their families. In IJM’s cases, they have met slaves who report being beaten, gang raped, locked in tiny rooms, starved and even witnessed murder. 2018 South Valley Community Church. All Rights Reserved.